Donna Hapac is an artist who builds. I build forms using natural materials to weave open structures inspired by nature. These forms function like drawings in space and cast complex shadows on walls and floors. After completing my education and showing paintings and drawings for a number of years, I needed a change of direction. While managing Chicago’s former Textile Art Center, which offered fiber art classes and exhibits, I discovered this unfamiliar medium and its creative possibilities and began working with reed and cane. Early in my evolution, I saw a chart of ocean currents fashioned from plant materials by Polynesian fishermen on display at the Field Museum of Natural History. Some of my early efforts in reed resembled this chart, but I soon leapt from two dimensions to three. Today, my fundamental technique of bending and tying reed is derived from this chart, but I have advanced beyond it to create fully sculptural forms. 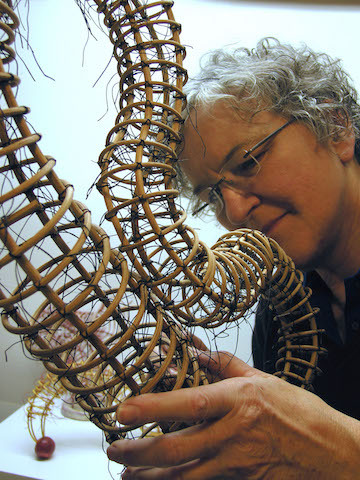 2016 exhibits include one-person show “Constructing Nature” at Brushwood Center, Ryerson Woods, Riverwoods, IL and “Interconnections: The Language of Basketry,” Hunterdon Art Museum, Clinton, NJ, “Memory & Forgetting, Part II” at the Cinnabar Gallery, San Antonio, TX in 2015, and the 2014 Willis Tower Sculpture Exhibition, Chicago. Other shows include three sculptures in “Fragile Relations: Art + Nature + Environment,” a multi-year (2012-2015) touring exhibit of Illinois artists, organized and sponsored by the Illinois State Museum. In 2004, I was honored to show one of my sculptures in the 11th International Triennial of Tapestry, Lodz, Poland. Degrees include a Master of Fine Arts in Drawing (1977) from Northern Illinois University, and a Bachelor of Fine Arts in painting (1971) from the University of Illinois in Urbana-Champaign.